It’s like a 60’s time warp – I’m inside one of the largest and lavish churches of the German late renaissance, staring up to the heavens and my ears are being assaulted by a deafening sound system echoing around the vaults. Light and images are being projected all over the walls and ceilings, bringing them to technicolour life. It reminds me of one of those psychedelic shows pioneered by Pink Floyd, but without the drugs. It doesn’t quite fit my stereotype of Switzerland – no alpenhorns or yodelling. 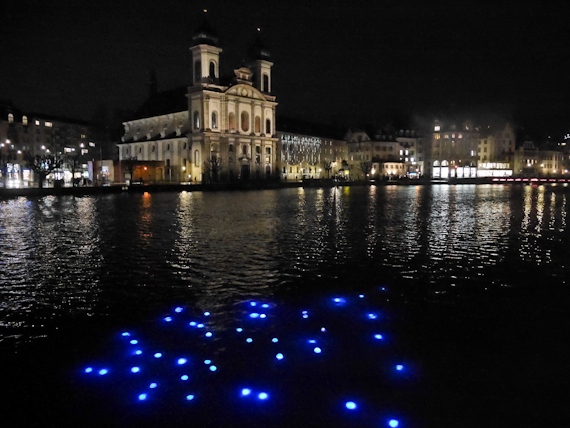 This is part of the Lucerne’s first ever Lilu Light Festival with 17 installations by Swiss and international artists scattered through the city for 11 days. 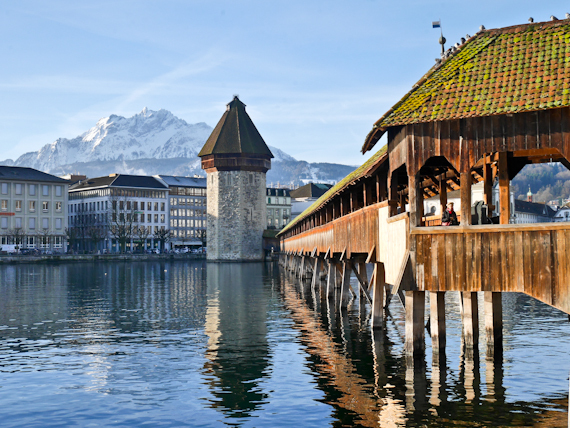 An old story says the city gets its name from the Latin word Lucerna meaning lamp – apparently an angel showed 8th-century Benedictine monks where they should erect a chapel, lighting the way with his lantern. This is one of the most attractive Swiss cities, situated by the lake of the same name and dominated by alpine twin peaks Mounts Pilatus and Rigi. 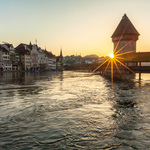 The Old Town has several decorated half-timbered buildings and the 13th century wooden covered Chapel Bridge spans the River Reuss, alongside the iconic octagonal Water Tower. Remnants of the old town walls exist on the hill above the town, complete with eight tall watchtowers. You may wonder why they feel the need to stage a light festival when the views are so stunning. But I begin to understand when I step out of the station into the pouring rain – the clouds are low and the mountains are hidden. Yet all around me in the near distance I can make out soft undulating coloured glows all over the city. Right in the lake is Fluorozoa by Labor5020, a series of blue lights like jellyfish, submerged under the surface of the lake. They say that their installation plays with the boundary between the natural and the artificial and it’s not hard to believe that the lights could be underwater creatures. 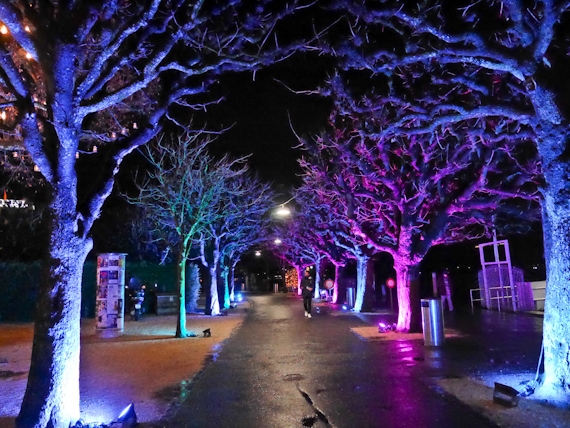 The Secret Life of Trees by Estonian artists Judith Parts and Jari Matsi is a light and sound show in an avenue of trees, turning the leaves a variety of colours. The idea is to convince you that trees are not lifeless creatures but breathing tall and strong entities, who will be here long after most humans. 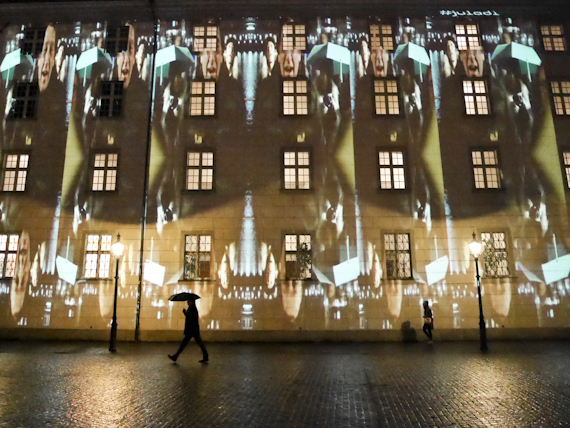 Juladi by Elke Radtke is an interactive projection on the walls of the council offices where you step in front of a camera. Your image then goes through a series of mirrors, effects are added and you get your super-sized selfie displayed large on the walls. It’s all great fun and certainly, people stop and have a go. Shake It by François Chalet is another interactive installation. You shake a giant snow orb which changes the display on a special stage called the Music Pavillion. It’s meant to warm you up with fiery skeletons, long-necked swans and dancing snowmen making the ice sing and the snowmelt. I mark this as one for the kids. Atoll by Karim Niazi and Simon Schwarz uses the pond in front of the Lion Monument to display a series of creature projections flying in and out of the water. Apparently, it’s all about climate change with the south coming to Switzerland and creating an atoll in the middle of the fish pond. 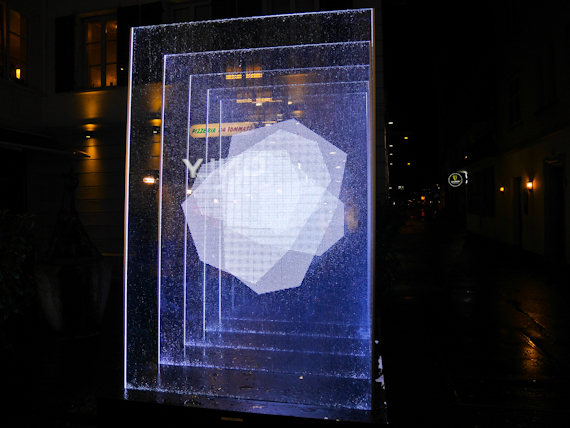 In the heart of the Old Town, Martina Horber & Vanessa Peter have created Novis – a tribute to the light that the angel brought to Lucerne long ago. It has something mystical about it, almost invisible in daylight but, in the darkness of the half-timbered buildings, it illuminates the shadows. 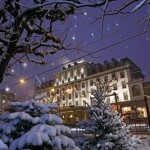 The 5* Hotel Schweizerhof is a comfortable base on the lake. The 3*Superior Hotel Pilatus Kulm is at the top of Mount Pilatus with amazing views of the city. The Lake Lucerne Navigation Company offers delicious culinary cruises on the lake. SWISS operates more than 170 weekly flights from London City, Heathrow, Gatwick (seasonal), Manchester, Birmingham, Edinburgh (seasonal) and Dublin to Zurich, Geneva or Sion (seasonal). The Swiss Travel Pass offers unlimited travel on consecutive days throughout the rail, bus and boat Swiss Travel System network. This pass also covers scenic routes and local trams and buses in around 90 towns and cities and also includes the Swiss Museum Pass, allowing you free entrance to 500 museums and exhibitions. Prices from £171 in second class.